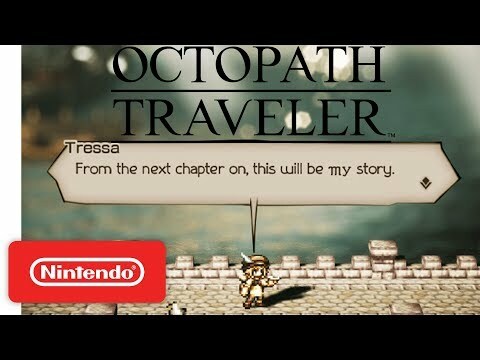 OCTOPATH TRAVELER is a brand new RPG in development at Square Enix, and will be a Nintendo Switch exclusive. Begin your journey as one of eight protagonists, each with their own origin, talents, and goals. Where will your journey begin? Who will you team up with? And where will you go next? All these decisions and more are completely up to you, the player. Each character has his or her own Path Action that can be used to interact with the people they encounter in a distinct way. For example, the warrior, Olberic, can “challenge” almost anyone to a duel. With one such duel he could expose an evildoer and bring them to justice, or force someone in his way…out of the way! The dancer, Primrose, on the other hand, can “allure” others into following her. With this power, she could track down a missing person and bring them back, or lure her enemies into a trap. She can even summon an allured character to help her in battle! In this game, battles are a fusion of simple, pick-up-and-play, turn-based battles…and all-new mechanics. One such mechanic is the Boost system, which allows you to accumulate Boost Points with each turn you take in battle. You can spend them to dramatically increase the strength of your attacks and abilities or use them to chain attacks. Try targeting an enemy’s weak point to break their guard, then deliver powerful blows while it's weakened! Or, if an ally’s in trouble, use it to get them right back into fighting shape. Identifying the right time to Boost may just be the key to victory. There’s a deep well of strategies to draw from, and your tactical genius won’t go unrewarded.